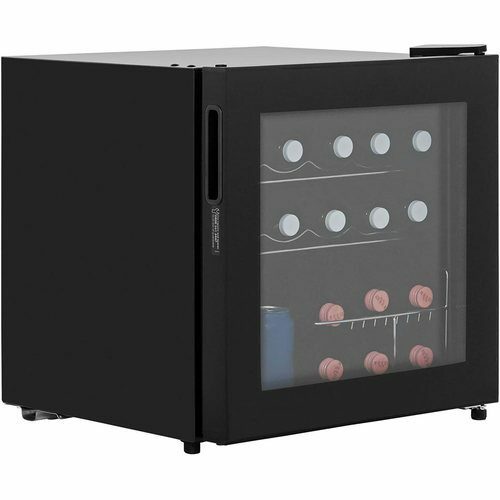 The LEC DF50B is a Compact yet Stylish Counter Top Drinks Cooler Fridge. Its Lightweight and Compact Characteristics make it ideal for moving from room to room or using on special occasions. With an Integrated Handle and Reversible Door, the fridge has been manufactured to be as versatile as possible. Measuring only 47cm(W)x50cm(H)x45cm(D), this compact fridge can be placed almost anywhere. With a 49 Litre Usable Capacity, wire shelf, chrome drinks shelves and can rack you can be sure to have enough room to chill all your wine, beer, and drinks. This units adjustable thermostat allows you to chill your drinks to the temperature you like best! Energy Saving Rating of A and recommended by the Energy Savings Trust, you know you are getting a really efficient appliance - costs just over £21.41 a year to run (annual consumption of 139kwh energy). Noise levels are also at a minimum with this device, emitting only 42db when running - the average conversation between two people is between 60-70db, meaning this appliance is discreet. Comes with a 1 Year Guarantee from the manufacture, LEC. Excellent fridge to free up some space in our main fridge where we didn't have space to cool many bottles of wine. Electrical World Replies: Hello , the lowest temperature this can be set to is 7-10 degrees. The normal setting is 11-15 degrees and the highest this could be set is 16-18 degrees. Thanks for the question. Hope this helps .